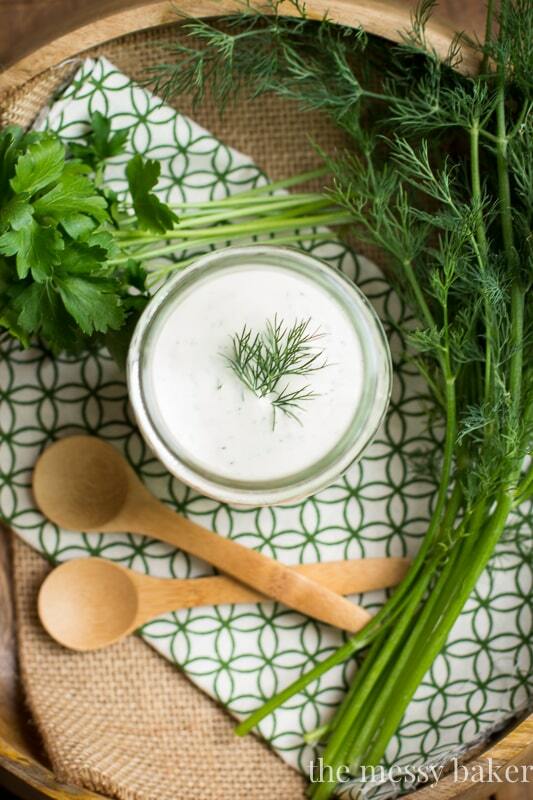 Creamy ranch dressing made with tangy buttermilk and fresh herbs. I have been on a serious salad kick lately; partly because the weather is warming up, and partly because I’ve been extremely lazy. I spend most of my days in the kitchen pumping out cookies, developing new recipes, and writing posts. By the time I’m finished, the last thing I feel like doing is cooking yet another meal. Hence the salad kick. You throw everything in a bowl and toss it with dressing. Viola, dinner is served. I very rarely buy salad dressing. It’s full of preservatives, additives, and a bunch of ingredients I can’t pronounce. Instead, I make my own dressing. 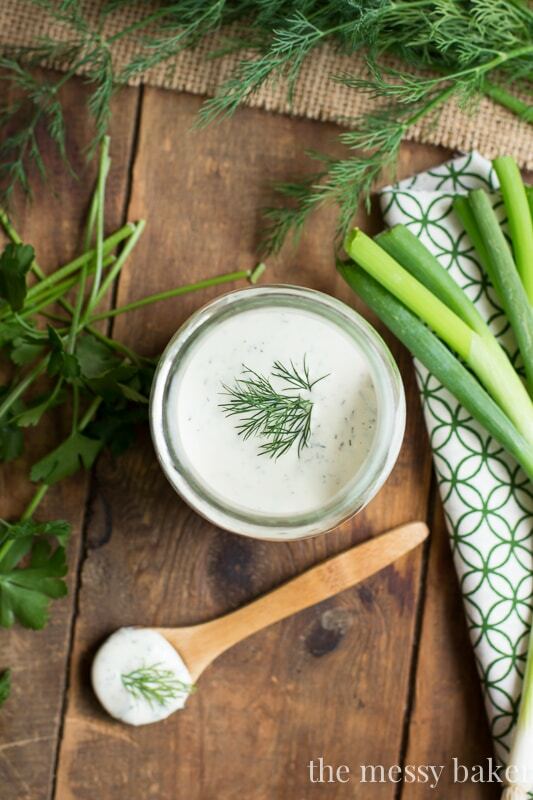 This homemade buttermilk ranch dressing recipe comes together in under 5 minutes. Since I usually eat a salad every day, I make enough dressing to last all week. I experienced an episode of excitement the other day as I stood in front of the herbs at my local market. I got a little grabby and started loading my basket full of fresh herb bunches. Thanks to my lack of self control, I had an overabundance of herbs lingering in my refrigerator that needed lovin’. I decided to make a tub of ranch dressing since it requires mass quantities of fresh herbs. The buttermilk base is a combination of mayonnaise, sour cream, lemon juice and buttermilk. I seasoned the dressing with garlic and a combination of fresh dill, parsley, and chives. This dressing is tangy, creamy, and full of earthy herbs. Drizzle it on your salad or use it as a dip for your veggies. Creamy buttermilk ranch dressing loaded with fresh herbs. Add all of the ingredients to a bowl. Whisk until the mixture is combined. Store in an airtight container and refrigerate for up to 7 days. Shake before serving. For a healthier option, use Greek yogurt in place of mayonnaise and light sour cream. I am so making this for my dad! He eats that crap from the bottle and it drives me nuts. It’s so gross! I had one of those throw every vegetable in my bowl salads the other day – it was so great! Your dad will love this dressing, Laura! I agree, I’m not a fan of bottled dressing. I NEED THIS!!! I love homemade salad dressings and I stay away from the store-bought stuff too. I eat salad every day and am always looking for variety, so this dressing is perfect for adding to my salad repertoire. Have a great weekend, lady! Too me, the store-bought dressing tastes artificial. Yuck! You’re going to love this recipe. Gorgeous photos, Jennie! Love the styling! And the dressing – I need to make it!! I must shake it up and try this ranch dressing! It sounds delicious and your photos are just breathtaking! I love the way you staged it and all the green. Plus it gives me a reason to be a little “grabby” in the fresh herb section! I’ve been there, Lindsey. Sometimes mixing up dressing is just too much. Thank you! I am always looking for new ideas for dressings, this looks fantastic. Thanks, Mariana! You’ll love this creamy dressing. and I so wanna make this dressing for Michael!!! Thank you so much, Kayle! Michael will love this fresh dressing. You will love it, Uru! Thanks. I LOVE homemade dressing! Once I started making my own, I was too spoiled to go back to the store stuff, so I’m always on the lookout for great home recipes. Thanks for this one, Jennie! I agree, Elizabeth. I’ve become a major dressing snob. Thanks! I just adore homemade dressings and this looks perfect! This is gorgeous ranch dressing, and trust me, I’ve never called Hidden Valley pretty before. I love how easy it is to whip up, too! Pinned! I never buy dressings. I usually just make a vinaigrette, but this look so creamy and delish. And I love all your fresh herbs. Pinning!